As a recruitment business, we have always set high expectations for suppliers - credibility, efficiency, ethics, transparency, confidence and flexibility. Consequently, our own high expectations of service from suppliers have filtered down into our ethos and have allowed us to offer you a level of service which we believe will bring satisfaction and fulfillment. The clinical research sector in Ireland is strong with a number of top pharmaceutical companies and contract research organisations (CRO's) having bases and headquarters here. Recruitment in the sector is strong and there is constant demand for Clinical Research Associates, Clinical Project Managers and other clinical trials professionals. 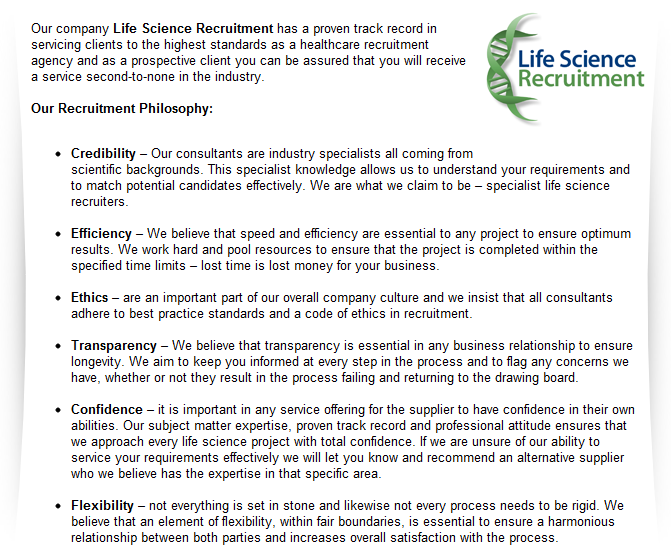 Here at Life Science Recruitment, along with our Clinical Research recruitment site we also provide recruitment services in other Life Science sectors such as microbiology, pharmaceutical and medical device. Our career portals for these areas can be found at our Pharmaceutical Recruitment Agency, Medical Device Recruitment Agency and Biotechnology Recruitment Agency sites. Outside of the life sciences we provide recruitment portals in the sales and supply chain sectors, these be found at our Sales and Marketing Recruitment Agency and Supply Chain Recruitment Agency sites.